Shares of the telemedicine provider jumped on another strong earnings report. Shares of Teladoc (NYSE:TDOC) were moving last month on an impressive first-quarter earnings report, as revenue surged on a jump in members and doctor visits. According to data from S&P Global Market Intelligence, the stock finished May up 18%. 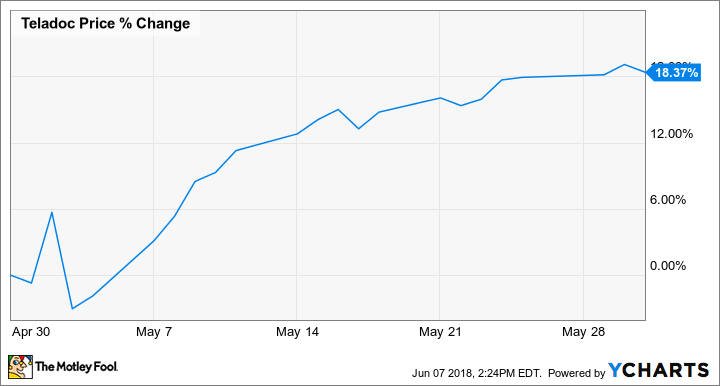 As you can see from the chart below, the earnings report came out at the beginning of the month, sparking momentum that carried through the rest of May. Shares of the world's largest telehealth provider jumped 6.4% on May 2 after its first-quarter report showed revenue jumped 109% to $89.6 million, beating its own guidance of $86 million to $88 million. Organic revenue, which backs out the effect of its acquisition of Best Doctors last year, was up 47%. Total paid membership in the period was up 41% to 20.8 million, and total visits jumped 57% to 606,000. On the bottom line, the virtual doctor's loss per share expanded from $0.30 to $0.39, which was ahead of analyst estimates of a loss of $0.43. CEO Jason Gorevic said the year was off to an "excellent start," adding that the intense flu season provided "another proof point for the inevitability of virtual care as a critical component of the healthcare system." Teladoc shares actually fell sharply the following day, though it was unclear why. Perhaps investors believed it had been overbought after earnings. Nonetheless, the stock moved higher for the duration of the month, indicating approval of the quarter's results. Teladoc offered solid guidance, calling for similar results in the second quarter, and full-year revenue of $350 million to $360 million on a loss per share of $1.36 to $1.41. At the midpoint, that represents 52% revenue growth, and the bottom-line forecast would be an improvement over the $1.93 loss per share a year ago. Earlier this month, Teladoc acquired Advance Medical, another virtual-care provider, for $352 million. The news sparked another modest rally in the stock, and serves as further evidence that Teladoc is consolidating its leadership in the fast-growing field of virtual medicine. Teladoc stock is now up more than 300% since a bottom in 2016, and could have more growth in store as the company chases a $29 billion opportunity in healthcare.